Sunshine, barbecues, bonfires, picnics, food, friends, family and more sunshine...Memorial Day Weekend 2014 has possibly been the best yet! Well, any weekend that gives me a chance to spend almost 30 hours outside in 80 degree sunny weather (in Ohio nonetheless) is fine by me. All of these fun social activities meant lots and lots of cooking, which made the weekend even better! I think the two biggest hits were the berry cobbler I made for my family cookout in Westlake on Sunday, and the homemade guacamole I made for the picnic at Edgewater Park Monday afternoon! I'm definitely not waiting until next Memorial Day to try these out again! 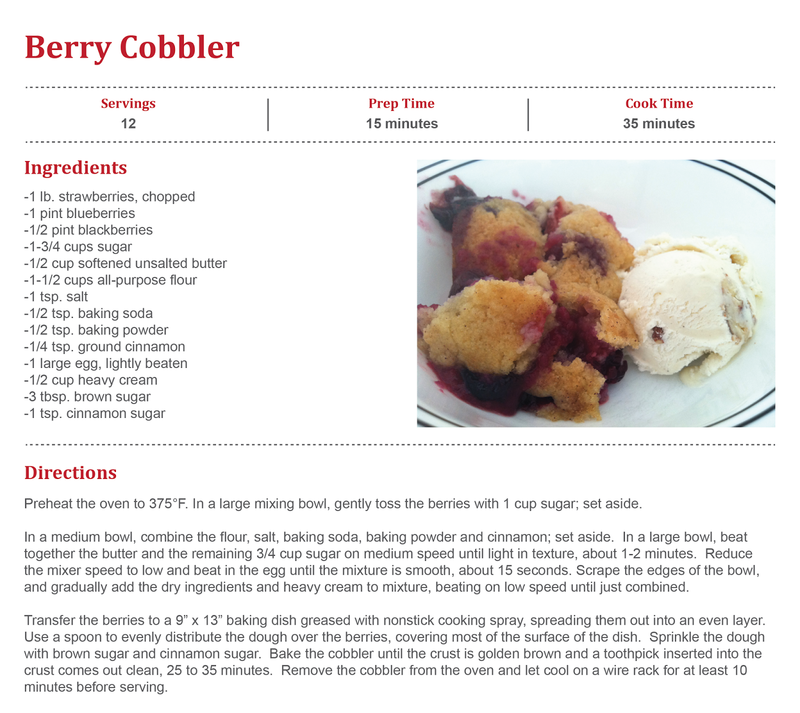 Nothing says Memorial Day more than berry cobbler. Not only does it taste fruity and light, but the colors of the strawberries, blueberries and blackberries are about as patriotic as you can get! I washed off a pound of strawberries, a pint of blueberries, and half a pint of blackberries really well and patted them dry. Afterwards, I placed the fruit in a medium-sized bowl and sprinkled them with 1 cup of sugar, mixing the fruit so the pieces are evenly coated. 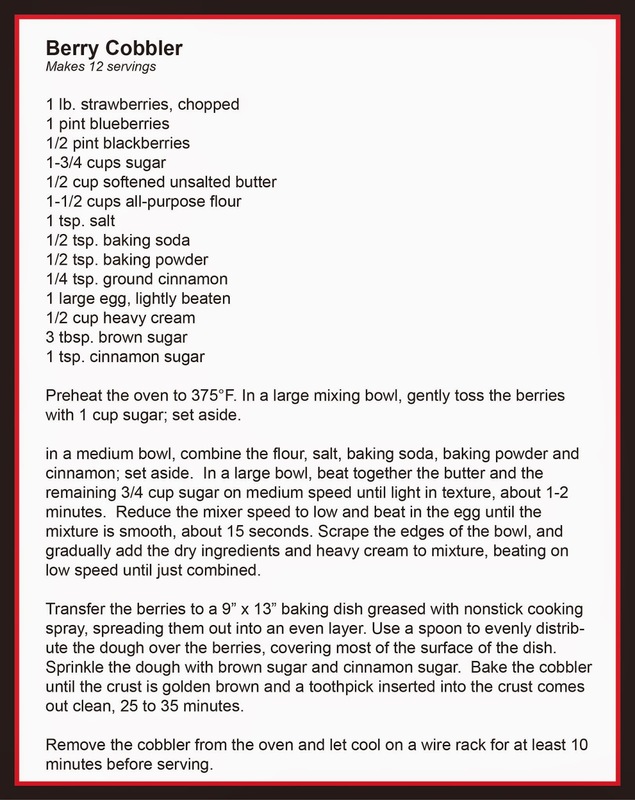 Set the bowl aside so the berries can macerate while you make the dough. In non-fancy cooking terms: set it aside so the sugar can begin to break down the berries and let all of the delicious juices out so the flavors can blend. I preheated the oven to 375 degrees Fahrenheit, and combined the flour, baking powder, baking soda, salt and cinnamon in a small bowl; set it aside. Meanwhile, I beat the softened butter and white sugar together in a large bowl until the mixture was really fluffy, about 1 or 2 minutes. I then added the egg and beat the mixture for an additional 15 seconds. Time to combine everything together! I added 1/3 of the flour mixture and 1/3 heavy cream into the wet ingredients; repeat this step 2 more times until all of the flour and cream has been used, beating well after each addition. This seems a little tedious, but if you add everything all at once, the dough could become tough instead of delicate. I sprayed a 9" x 13" glass baking dish with nonstick cooking spray to prevent the berries from getting stuck to the dish. You can use a metal pan if you have no other option, but I love being able to see the layers in a glass dish. I arranged the berries in an even layer, and then used a spoon to drop clumps of the dough on the top of the berries. Try to get the dough evenly distributed, but don't worry if it doesn't look perfect. A) Cobbler is a pretty rustic dessert by nature. B) Everything kind of melts into each other in the oven anyway. Sprinkle the brown sugar and cinnamon sugar all over the top of the dough before you bake it to add a crunch and depth of flavor to the crust. Bake the cobbler until the edges are a nice golden brown, and a toothpick inserted into the middle of the dough comes out clean. This can take anywhere from 25-35 minutes; mine took about 31 minutes. The last step isn't exactly in the recipe, but you're pretty much obligated to serve it with butter pecan ice cream. Heaven in a bowl, I swear. Not going to lie, I walked into Giant Eagle yesterday with the intention of buying pre-packaged guacamole. After I saw the $5.99 price tag, I was thinking "forget it, I'm going to finally try to make it myself! With the number of times I've watched them make it on Food Network, I don't even need a recipe!" So I didn't use one. And it was perfect. I started with 2 ripe avocados, a roma tomato, 1/4 of a purple onion (which I forgot to add to the bowl for this picture), and a lime. If the avocados aren't ripe when you buy them - which they usually aren't - put them in a tightly sealed paper bag on the counter, preferably in sunlight. They'll be ready within 24 hours. I was so ready to try the slicing technique I've seen on Food Network that makes it easier to scoop the inner part of the avocado into the bowl. It really works! After finely chopping the tomato, purple onion and fresh cilantro from my new plant, I added them to the avocado with 1/2 teaspoon of salt and a dash of black pepper. I mixed everything together, mashing about half the avocado and keeping the other half a little chunky to add texture to the guacamole. I squeezed the juice of 1 lime on top of the mixture and stirred it all together. 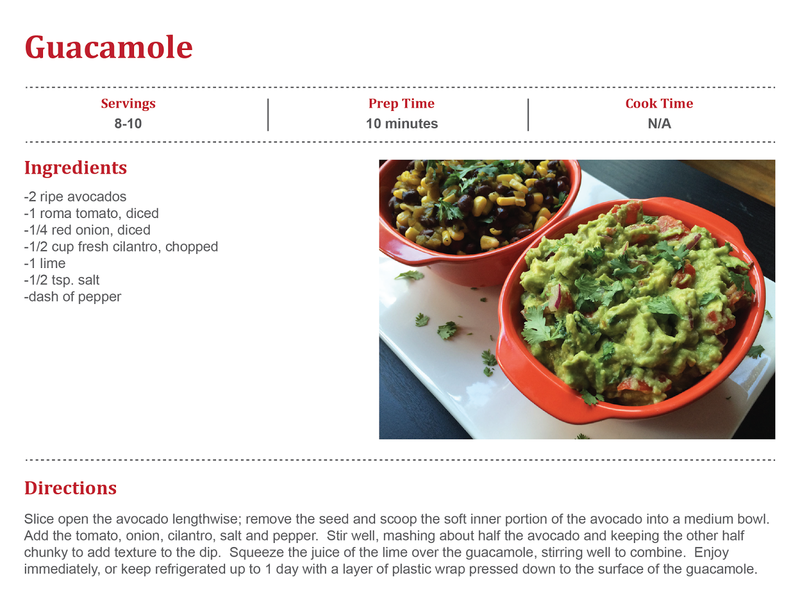 This not only marries all of the Mexican flavors of the dish together, but it prevents the top of the guacamole from turning brown when it's exposed to air. In retrospect, you actually don't even need to worry about it turning brown because it was devoured before that could even happen. Don't forget the tortilla chips!